British rock legends Def Leppard take their live spectacle to the big screen with concert film 'Viva Hysteria' hitting UK cinemas on September 19th. 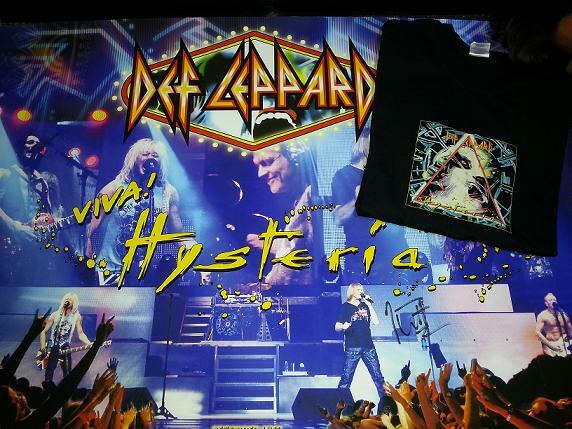 We've got the pleasure of a giving away a 'Viva Hysteria' t-shirt and a poster signed by frontman Joe Elliott - check out the goods in the picture above. Enter away below. Filmed live at the Hard Rock Hotel in Las Vegas earlier this year, 'Viva Hysteria' compiles a nine night intimate residency including the band's biggest hits and the entire 'Hysteria' album. Catch 'Viva Hysteria' at one of its special screenings worldwide, with UK fans being some of the first to catch the film at selected cinemas on September 19th. In the meantime, enter our competition below to grab some special Def Leppard goods. HOW TO WIN: For your chance to win a poster for 'Viva Hysteria' signed by Joe Elliott, as well as a t-shirt, enter through Facebook and/or Twitter. UK residents only please. 2) If entering via Facebook, please like our Facebook page, and add a comment with your favourite Def Leppard track here or in the embed below. 'Viva Hysteria' will be screened in limited UK cinemas on September 19th. Find more info and specific screening details at vivahysteria.com.